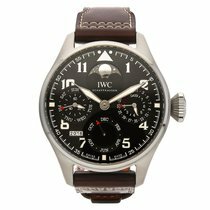 The Big Pilot from IWC delivers exactly what its name promises: It's a large tool watch created specifically for pilots. IWC introduced this classic watch for the first time in 1940 and since then it has gained cult status. 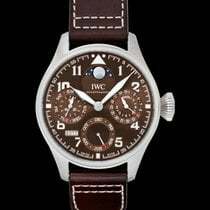 The International Watch Company, better known as IWC, has been producing watches meant for pilots since 1936. In 1940, during the Second World War, the company introduced the 52-caliber T. S. C. Big Pilot's Watch. The timepiece, reference number 431, had a 55-mm case and weighed 183 grams. It remains the largest watch IWC has ever produced. Its case size was, at the time, much larger than average due to the use of an in-house movement originally developed to fit pocket watches. The watch ran precisely and in accordance with the chronometer norm. The central seconds could be stopped in order to allow pilots and navigators to sync their watches with each other or with a time signal to the exact second. Altogether, the imposing IWC timepieces met the technological standards of the time. The dial had a similar design to the circular cockpit instruments in propeller planes such as the Junkers Ju 52. Clear legibility even under poor lighting conditions was a predominant concern. Thanks to the watch's large dimensions, only one look was required to gather the time. The design was based solely around its legibility: A black dial contrasted with the white stick indices, Arabic numerals, and sword hands. A triangle marked the 12-hour position, and luminous material ensured that the watch was legible at night. The German Air Force supplied their crews with these IWC watches. However, IWC combined Swiss neutrality and business sense in a unique way: The Mark XI from 1948, another legendary pilot's watch, was purchased by the British Royal Air Force and used for 30 years. The Big Pilot's Watch from 1940 has experienced multiple comebacks. The first was in 2002 with the Big Pilot's Watch, which is still part of the collection. The original 55-mm case size wasn't practical for everyday wear, so IWC downsized the newer watch to 46 mm with a thickness of 16 mm. They also added a round power reserve display at three o'clock to an otherwise sparse dial. The watch has an impressive power reserve of seven days; it's even more impressive when you consider most other mechanical wristwatches have power reserves lasting less than two days. The automatic movement features a Pellaton winding system. The system is named after its inventor, Albert Pellaton, who was the technical director at IWC for many years. The patented mechanism winds the movement bidirectionally and, together with the long mainspring, enables a week-long power reserve. The Big Pilot's Watch also has a date display at six o'clock, a feature not present on the 1940 model. The striking, large onion crown is screw-down. The watch is waterproof to 60 m, equal to a pressure of six bar. The historical origin of the watch's design is easy to see, as it has a black dial with white sword hands, white stick indices, and Arabic numerals. There's even a triangle at 12 o'clock instead of the numeral, giving the Big Pilot a clear retro look. The in-house caliber 51111 is protected by a soft-iron case designed to prevent deviation from the correct time caused by magnetic fields. The case was necessary since there are strong magnetic fields present in airplanes caused by the electricity needed for fuel injection. The case back of this stainless steel watch with reference number IW500912 features an engraving of the famous German aircraft Junkers Ju 52. IWC added two additional Big Pilot watches to their portfolio in 2016, both of which followed in the footsteps of the original from 1940: the Big Pilot's Heritage models, available in 48 and 55 mm. Both have a titanium case and weigh 120 and 150 grams, respectively. By and large, they look the same, apart from their size difference. The hands and indices on the black dial are somewhere between antique white and cream. Together with the riveted, brown calfskin strap, it has a much more old-fashioned feel than the 46-mm Big Pilot. Furthermore, one important difference is how the watch is wound. The Big Pilot from 2002 winds automatically from arm movements, while the newer watches require the wearer to wind them via a crown. The in-house caliber 59215 powers the Big Pilot's Heritage Watch 48 with an impressive eight-day power reserve. The power reserve display is located on the back side and visible through a small, round opening in the titanium case. The dial has a central seconds and minute hands as well as a small seconds at six o'clock with an integrated date display, and the white sword hands feature blued borders. The Big Pilot's Heritage Watch 55 has a diameter of 55 mm, exactly matching its historical predecessor. It is powered by the in-house caliber 98300, which has no date display or power reserve indicator - also like the original. However, unlike the watch from the 1940s, it doesn't feature central seconds, but rather a small seconds at six o'clock. Are you looking for an impressive, large watch with a functional design and retro flair? Then you should consider the Big Pilot. If the Big Pilot participated in a pilot's watch competition, it would certainly win top prize. That's no surprise - it's the quintessential pilot's watch with a diameter of at least 46 mm, a contrasting black/white color combination, and a clear dial. The watch is even more eye-catching when paired with a suit and tie. It doesn't simply disappear under shirt sleeves, as it's meant to be worn over flight suits. The Big Pilot can be considered an uncompromising alternative to the classic dress watch. If the "regular" Big Pilots would win, then the Heritage models with their larger diameters of 48 and 55 mm would certainly receive even higher marks. 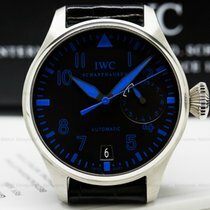 IWC produced these watches in a limited run of 1,000 48-mm watches (reference number 5103) and only 100 55-mm versions (reference number 5104). For the smaller Heritage model, you should be prepared to pay around 13,000 euros. The much rarer 55-mm version initially cost around 15,000 euros, but it has risen in value due to its limited run. Other special editions are available in the five-figure range, such as a version with an 18-karat red gold or platinum case. IWC abandoned the Big Pilot's minimalism in some models, adding complications like a perpetual calendar. These versions range from 20,000 to 30,000 euros. The stainless steel Big Pilot is significantly more affordable; new, it costs around 10,000 euros. The pocket watch caliber which IWC used to power their first large pilot's watch is nicknamed the Jones caliber after the founder of the company, Florentine Ariosto Jones (1841 - 1916). The Bostonian founded the company in 1868 in Switzerland, but import taxes to the United States were expensive. In the end, exporting the watches from Schaffhausen failed. IWC changed owners many times after Jones left the company and today it belongs to the luxury goods concern Richemont. Richemont also owns famous brands such as Panerai and Cartier.